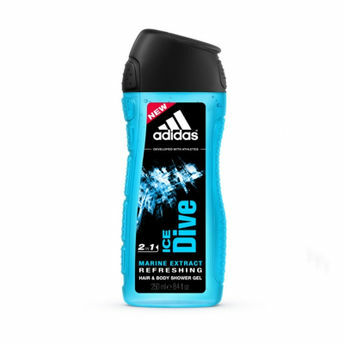 Adidas Ice Dive Shower Gel is a fragrant gel cleanser that comes with a pH balanced, dermatologist-tested formula that produces a rich foam for a gentle cleansing experience. Enriched with Marine Salts to give you a surge of freshness and energy instantly, it delivers an uplifting aroma in a uniquely packaged bottle that offers a textured grip leaving your skin refreshed and invigorated. Features a pH balanced, dermatologist-tested formula. Produces rich foam and gently cleanses the skin. This shower gel can be used on Hair, Body & Face.